Absolute is a beautifully patterned bull. He is a perfect footed bull with all claws uniform in size and shape. His neck ties in high on his shoulder and he has an amazing length of body and extension through the neck area. He is stamping his progeny with the same unique eye appeal. 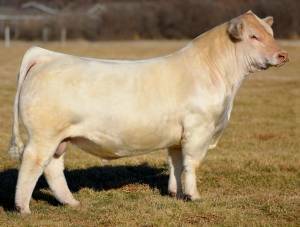 His dam is a full sib to the great SHF Rehab that is continuing to put his stamp on the Shaffer Cattle Company program. His first crop of heifers has already produced a $20,500 heifer.